ADVERSE and AVERSE are easy to confuse. They may sound similar but they have different meanings… and I have a simple tip to remember the difference between them. The best way to remember the spelling of adverse is to think of the D in adverse and D for damage. AVERSE means having a strong dislike for something. It’s often followed by the word ‘to’: for example, “I’m averse to bad weather” or used in a phrase like ‘risk-averse’. 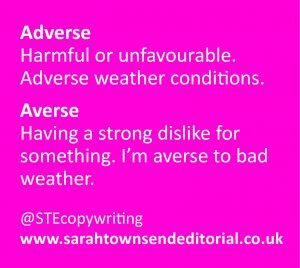 ADVERSE and AVERSE are both fairly formal, slightly stuffy-sounding words, so you may be better off rewording your sentence altogether to avoid them.